You can learn more about how we exploit differences between company reported EPS (GAAP) and a more operational EPS (non-GAAP) that dictates the true earnings power of a company here. We later put out a series of updates on BXC for our Premium Members while the stock continued a largely sideways to slightly upward trend, even adding it to a few of our contrarian model portfolios designed to take advantage of pullbacks and/or muted reactions to news that we feel at times is misunderstood. These portfolios are fittingly named “Pullback Portfolios”. During our due diligence process, we learned that Private Equity firm Cerberus Capital was a long-time investor in the company. Cerberus’ overhang in the stock suppressed the stock price but speculated they would look for an exit soon. In September 2017, we observed weakness in the stock, and anticipated that Cerberus would soon try to sell its stake because Cerberus’ fund, which invested in BXC, was winding down. The shares were sold in a non-dilutive secondary offering through an underwriter, BTIG LLC, at $7.00 per share. No new shares were issued. Cerberus just opted to sell its stake through an underwriter. Not only was there an opportunity to get a great return on a sizable number of shares in a trade, but we also believe opportunities like this can enable investors to build sizable positions in quality companies to hold longer term. BXC stock never reached the offering level price of $7.00 in open market trading. BXC ($7.20) – We are considering constructing Reasons for Tracking on Bluelinx Holdings. BXC distributes building products in North America. The company distributes products in two principal categories, structural products and specialty products. This $7.20 company is taking steps to improve margins and reduce its mountain of debt. If successful, there could be massive incremental gains in EPS and EBITDA. We encourage our members to review the company’s conference call transcripts for more information while we continue our research. BXC ($7.34) – On June 27, 2016 we stated we are watching BXC closely due to the company taking steps to improve margins and reduce its mountain of debt. If successful, there could be massive incremental gains in EPS and EBITDA. 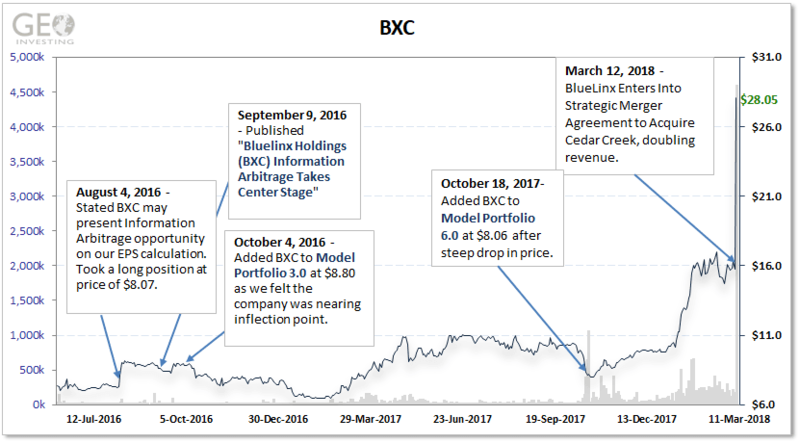 BXC ($8.73) – In our June 27, 2016 morning premium member email we stated we were taking closer look at BXC due to recent steps to improve margins and reduce its mountain of debt. On August 4, 2016, BXC reported strong Q2 2016 results showing that the steps they are taking are beginning to pay off. We disclosed our long position on August 4th. Further due diligence strengthens our bullish assumptions on the BXC story. More details to come. BXC ($8.87) announced it has completed the sale of 3 facilities for net proceeds of ~$1.9 million. The Company also announced it has 6 other non-operating facilities under contract which will generate ~$30 million in net proceeds by year end which it intends to use to pay down its debt burden which we discussed in our original note from June 27, 2016. If the Company uses the full $30 million to pay down its debt, we calculate the interest savings to add ~$0.20 (non-taxed) EPS on an annual basis. We used non-taxed for our calculations because the Company has a large amount of NOL’s ($267 million) that should shelter the tax burden for a prolonged period. We initiated our long position on August 4, 2016 on the heels of BXC’s strong Q2 2016 results. See earnings recap here. Today we have published two articles, one on Bluelinx Holdings Inc. (NYSE:BXC), and the other on [premium only]. 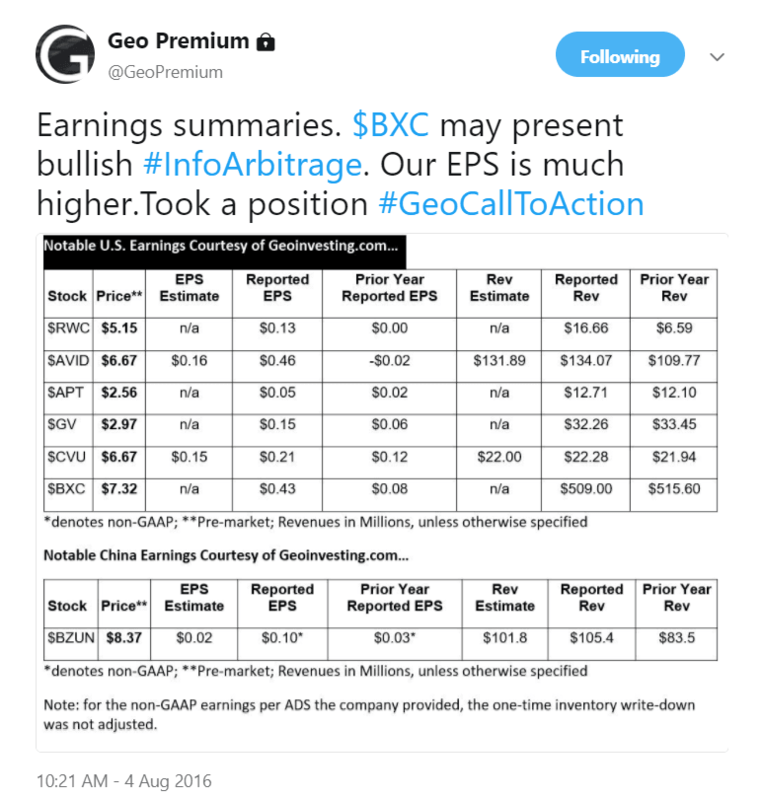 We have covered both stocks in recent research, releasing a “Reasons For Tracking” analysis on [premium only], and mentioning BXC as a compelling case based on potential margin improvements and company actions to reduce its mountain of debt. “Our performance this quarter confirms that we continue to make good progress on our key strategic initiatives of monetizing our real estate and deleveraging the balance sheet. We have successfully extended our asset-based credit facility, prudently managed our working capital, and sold several of our unoccupied facilities which have enabled us to significantly reduce our debt from 2015 third quarter levels. In addition, we continue to focus on our customers through our local market emphasis as we improve our operational efficiencies and bottom line,” said Mitch Lewis, President and Chief Executive Officer. “We are pleased to share the strong finish we had in 2016 which demonstrates our continued focus on our key strategic initiative to deliver the Company through monetizing our real estate and improving our working capital. The successful execution of this strategy enabled us to improve our financial performance while significantly reducing our debt from prior year levels. We continue to evaluate alternatives to reduce the Company’s leverage and enhance liquidity,” said Mitch Lewis, President and Chief Executive Officer. Susan O’Farrell, Senior Vice President and Chief Financial Officer added, “Since announcing our deleveraging plan, we have sold eight unoccupied properties during fiscal 2016, which generated gross proceeds of $36.4 million. Furthermore, we have successfully reduced our debt principal by $84.0 million from this time a year ago. We were hoping the company could maintain profitability even in its seasonally weaker quarters (Q4 and Q1), but it appears for the time being (until gross margins and operating margins improve), the company will have to drive higher revenues and/or continue to reduce its debt. Fortunately, these are two important goals the company has set for 2017. Until the company’s restructuring efforts are fully completed, it looks like adjusted EBITDA growth will be the valuation metric we use. BXC ($8.28) shares have been trending up the past week in sympathy with some other building supply stocks like Huttig Building Products, Inc. (NASDAQ:HBP), which hit a new high on Thursday. We initiated our long position in BXC on August 4, 2016 on the heels of strong Q2 2016 results and restructuring efforts playing out (shares opened at $7.50 on Aug 4th). See our initial recap here. It’s been a bit of a roller coaster ride. Shares reached a new 52 week high of $9.70 just days after our original note, then retraced to the sub $7 level before beginning this recent uptrend. “With these property sales and all others incurred since April 2016, BlueLinx will fully satisfy its July 2017 CMBS mortgage payment obligation of $60 million three months ahead of schedule. Less than a year ago we announced our initiative to reduce the Company’s financial leverage and are delighted to share that we continue to successfully execute on our strategy to deleverage BlueLinx. We are exploring additional sale and leaseback transactions, alternative refinancing options as well as other real estate optimization strategies to continue to improve the Company’s leverage and financial strength,” said Mitch Lewis, President and Chief Executive Officer. As we stated in our March 20, 2017 update, we initiated our long position in BXC on August 4, 2016 on the heels of strong Q2 2016 results and restructuring efforts playing out (shares opened at $7.50 on Aug 4th). See our initial recap here. The stock has been on a bit of a roller coaster ride. Shares reached a new 52 week high of $9.70 just days after our original note, then retraced to the sub $7 level before beginning this recent uptrend. BXC ($10.33) shares have been strong the last several weeks, reaching a new 52 week high of $10.46 on April 24, 2017. We initiated our long position in BXC on August 4, 2016 on the heels of strong Q2 2016 results and restructuring efforts playing out (shares opened at $7.50 on Aug 4th). See our initial recap here. The stock has been on a bit of a roller coaster ride since, dipping to the low $6 level before regaining its footing and now hitting new highs. An added caveat that we have been tracking is that Cerberus Capital, a household name in the private equity industry, still holds a 52% position in BXC. Cerberus will eventually liquidate this position and we are watching closely how minority shareholders will be treated. We are no strangers to Cerberus Capital. In a similar ownership situation involving Blue Bird Corporation (NASDAQ:BLBD), we spoke out in a Barron’s interview about what we perceived as a bad deal for shareholders. The fact that the bad deal was refused, and the stock is now trading near all time highs, gives us more confidence that the ownership situation in BXC can be resolved. BXC ($10.27) a leading distributor of building and industrial products in the United States, announced that Cerberus Capital Management has commenced a secondary offering of 3,863,850 shares of BXC common stock. We initially discussed our bullish thesis on BXC as a restructuring play in June 2016. We initiated our long position in BXC on August 4, 2016 on the heels of strong Q2 2016 results and restructuring efforts playing out (shares opened at $7.50 on Aug 4th). One caveat we had mentioned in our early note was that Cerberus Capital, a household name in the private equity industry, held a 52% position in BXC. We stated, Cerberus will eventually liquidate this position and we are watching closely how minority shareholders will be treated. We will look to see what the offering is priced at in the coming days. “A caveat that we have been tracking is that Cerberus Capital, a household name in the private equity industry, still holds a 52% position in BXC. Cerberus will eventually liquidate this position and we are watching closely how minority shareholders will be treated. While this is certainly a temporary setback, with no fundamental change in the business, we feel shares should recover and possibly reach new highs in time, similar to BLBD. On October 19, 2017 we added BXC to our Buy on Pullback Mock Portfolio 6.0 as we felt the share sell off based on the non-dilutive financing was overdone. BXC is also part of our Buy on Pullback Mock Portfolio 3.0 since October 2016. We are pleased to share our 2017 results, including our best full year gross margin and net income on record and our best full year Adjusted EBITDA since 2006. These results, coupled with the four sale-leaseback transactions we completed on January 10, 2018, position us well to capitalize on our anticipated continued strength in the markets we serve,” said Mitch Lewis, President and Chief Executive Officer. With the majority of cost restructuring initiatives behind them, BXC has now reported two straight quarters of top and bottom line improvements and seems well-positioned to continue this trend in 2018. We initially took our position in BXC in August of 2016 when the stock was trading at ~$8.00. BXC has been part of our “Buy on Pullback Mock” Portfolio 3.0 since October 2016. On October 19, 2017 we also added BXC to our “Buy on Pullback” Mock Portfolio 6.0 on a selloff that was based on the non-dilutive financing. And lastly, in the Q&A, when asked about how far along the company is with the EBITDA margin improvement initiatives, CEO Mitch Lewis stated he thinks of them as in the third inning and sees further opportunities to improve. Bluelinx Holdings (NYSE:BXC) ($15.79; $144.3M market cap), a building supply company, announced a strategic agreement to acquire Cedar Creek, a leading building products wholesale distributor. This development only confirms our belief that BXC is in the early innings of its come back story and that shares should move much higher from current levels. If consummated, the deal almost doubles the size of the company in terms of revenue and results in immediate $2 in EPS accretion , from our first look at the details. But the accretion could be meaningfully higher moving forward. As far we can tell, the acquisition will be funded by cash on hand and new revolving credit facility . But we would not rule out an equity raise in the near future, given the large amount of earnings potential from the deal. This means that increased earnings would still occur if the company were to effect a small equity raise. One thing we want to look into is how much of Cedar Creek revenue is generated from new construction vs. the remodeling market. BXC currently has minimal exposure to the less cyclical remodeling market. “We are pleased to announce the combination of Cedar Creek and BlueLinx,” said Mitch Lewis, President and Chief Executive Officer of BlueLinx. “Cedar Creek’s commitment to organic growth and its customers as well as its track record of successful acquisitions make it an ideal partner for BlueLinx. The combination will significantly enhance our product portfolio by providing greater breadth and depth of building products and services for our customers and suppliers across our markets. This transaction will create a leading U.S. wholesale distributor of building and industrial products, and significantly enhance the value that we can deliver to our customers, as well as our supplier partners, and end-market consumers. BlueLinx and Cedar Creek’s combined revenue was $3.2 billion in 2017 and its pro forma LTM Adjusted EBITDA for 2017 would have been approximately $154 million including at least $50 million of annual cost savings. The transaction is expected to close within 45 days. 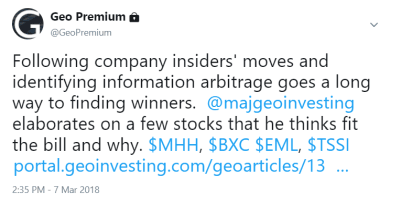 Seeking Alpha has published a version of the article this morning, with MHH and EML being explicitly mentioned. The extended research on BXC and TSSI is still only available at our pro portal.